Being a dad I’ve hosted birthday parties in the past and have often had to go to birthday parties of the children of friends of ours. It’s a trade off – you buy my kid a gift and that entitles your child to receive a gift from my kid at your kid’s next party. Every parent is paying off the other parent so that their kids can get something at the birthday party when it rolls around to being your child’s time again. And often you’ll put a lot of effort and caring into choosing that special birthday party gift. What does the child like? What is the age range on the gift? Does it have small parts and do they have a younger sibling that might choke on those parts? You want to make sure that you don’t get something that the kid won’t play with because more and more stores aren’t letting you return, or even exchange for that matter, toys that don’t have a receipt with them. You end up putting a lot of research into determining just what kind of present you’re going to buy. But lately there’s a new trend that until now I hadn’t noticed – the host of the birthday party (the birthday partier, if you will) not opening their gifts that the invited got for said partier until after the party’s over and everyone’s gone home. After your effort, aren’t you entitled to a little closure with that present that you took care to find and wrap? What’s up with that? You take your present to the party, your child has fun, and then you leave without the host opening their gifts. It’s like watching all the way up until the end of Star Wars and not seeing if the Rebels destroy the Death Star. Anyway, I’m sounding the klaxon that this is a completely uncool trend. Let it end now, parents of would-be present non-openers. Don’t even try it, muthas. 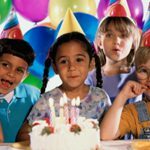 Share the post "A Disturbing Trend in Children’s Birthday Parties"
Previous Post: Why is Everyone Scared of You When You’re Wearing a Ski Mask?